April 27, 2013, Kamloops, B.C. 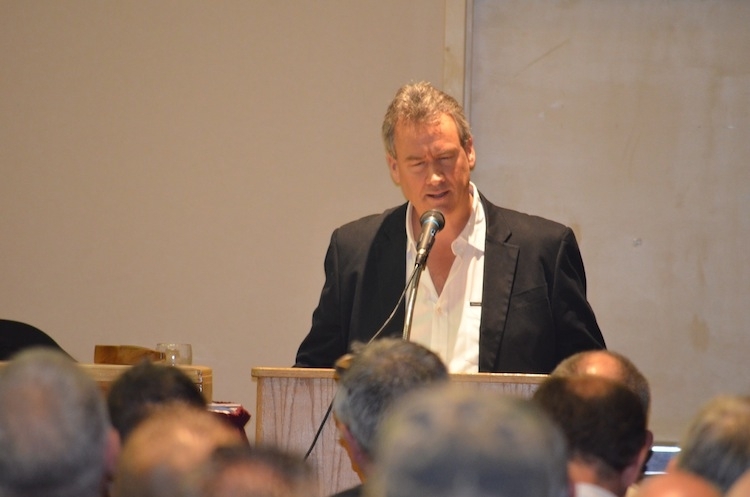 – Alistair Cook said the words that many people in the room wanted to hear from a senior executive at one of Canada’s largest sawmill operators. “There is lots of optimism coming back to North America,” said Cook, senior vice-president of wood products operations at Canfor. Cook was the keynote speaker at the B.C. Saw Filer’s Association’s annual general meeting, held in Kamloops April 26 to 27. Cook spoke to a room of close to 150 saw filers from across B.C. and Alberta. Cook started his presentation by stressing the importance of the developing market in China, which continues to increase its demand for Canadian timber, creating part of the optimism for a rebounding provincial forest industry. In 2011, Canfor sold more than 1 billion board feet of lumber to China, most of which was low-grade timber. He estimated that sales in 2012 were similar to that of 2011, and that number will sustain itself once again in 2013. Cook also suggested that the strength of the Chinese market was a good evolution for the B.C. forest industry. With the continued development of that market, wood suppliers are no longer relying on the boom or bust of the U.S. market to determine the health of the B.C. industry. But that move would only be sustained if B.C. lumber suppliers continued to grow the Chinese market in the face of increasing lumber prices in North America. In addition to China, Cook mentioned that Canfor has also recently expanded their sales into Asian markets that he never expected they would be selling to. In the past few years, Canfor has begun selling to Malaysia, Thailand and Pakistan, and sees opportunity for expansion into a growing market in India. For more news and information from the B.C. Saw Filer’s AGM in Kamloops, check out the MayJune edition of Canadian Forest Industries magazine.